This Christian camp has horseback riding, archery, swimming, hockey, cooperative games and more, and boasts 3rd generation campers. Kids have been raving about the wonderful family-style meals for over 47 years. A traditional camp experience in a fresh and dynamic way. Our core Christian teaching, creative staff, excellent food and exciting recreational programs inspire kids and keep them coming back year after year. Summer camp offering a program of outdoor activities such as archery, hiking, rock climbing, swimming, canoeing, kayaking, rabaska, camp fires, camping, counselor training etc. Lifelong friendships await! A private lake, archery, crafts, stand-up paddleboarding, swimming, canoeing, kayaking, out-trips, campfires, and so much more. Also offers a focus on leadership. An Experience Like No Other! Bilingual (Fr/En), traditional summer camp offering water and land sports, such as sailing, water-skiing, archery, horseback riding, and hiking/canoeing out trips. Spend the summer with campers from around the world! A one-of-a- kind March Break and summer camp experience with 11 weekly themes including science, history, arts and crafts, sports and more, all in Mandarin! Bring your swimsuit in the summer and join us in the sprinkler! An educational day camp for children 5 to 12. Kids get to experience life in the 1860s while playing games and learning new skills. A unique basketball camp led by experienced instructors that helps kids develop skills in dribbling, shooting, passing and footwork and take part in traditional overnight camp activities. Adventure camps listed above offer you the option of fun in the fresh air, within the secure confines of a summer camp environment. If your child is the adventurous type who likes to challenge her or himself and grow through unique experiences and adventures, browse our listings of adventure camps to find one perfectly suited for your needs. Not all adventure camps are the same, of course. There are camps offering a variety of activities from wilderness adventures or whitewater rafting to "tamer" pursuits such as canoeing, guided rock climbing, high ropes and obstacles courses. Many of the more adventurous camps require group activities so your child will learn teamwork and develop team-building kills. There is little better way of building character over summer holidays (or even March break) than for your child to throw herself into an adventure-oriented summer camp. Some other adventure camps you can participate include animal camps, such as camps offered by zoos or conservation areas where children can learn close care of wild animals. Of course, there are many who argue that all summer camps are, in fact, adventure camps. 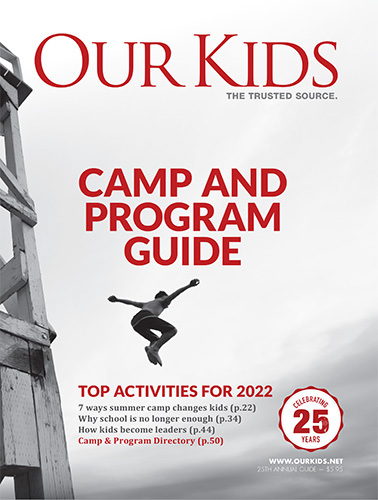 Read more: In the 2010 issue of Our Kids Go to Camp, our writers explored how kids face down challenges inside several summer adventure camps.